President Mohamed Morsi and the Muslim Brotherhood have been removed from power by the military establishment in the wake of massive demonstrations on June 30 that proved to everyone that Morsi had lost all claim to legitimacy and popular support. Now, as the Revolutionary Socialists of Egypt argue in their statement, the next phase of the Egyptian revolution that started in January 2011 with the movement that toppled Mubarak has started--and revolutionaries must rise to the challenge of offering an alternative that meets the demands of that revolution for bread, freedom, social justice and human dignity. WHAT HAPPENED on June 30 was, without the slightest doubt, the historic beginning of a new wave of the Egyptian revolution, the largest since January 2011. The number of people who demonstrated on that legendary day is estimated to exceed 17 million citizens, something unprecedented in history. The significance of this surpasses any participation by old regime remnants, or the apparent support of the army and police. Mass demonstrations of millions are exceedingly rare events in human history, and their effect on the consciousness and confidence of the populace in themselves, and in their power to change the course of history, transcend the limitations of the slogans raised and the political alternatives put forward. Yes, the liberal bourgeois elite wanted to use this mass impetus to overthrow the rule of the Islamist elite, in order to themselves reach power with the endorsement and support of the military establishment. And it is true that the feloul [remnants of the old regime] wanted to return to the political scene by way of this new revolutionary tide. But there is a special logic to popular revolutions that will not submit to the illusions or schemes of the liberals or feloul, even if sections of the masses were temporarily affected by the slogans and promises of that elite, just as they were affected before by the slogans and promises of the Islamist elite. Yes, there is the influence of the huge media and propaganda campaigns, undertaken by sections of the ruling class opposed to the Muslim Brotherhood, about how the army and police are standing with the people, about their neutrality and patriotism--even their "revolutionary nature"! But this influence is momentary and superficial, and cannot erase the memory and direct experience of the people of the counterrevolutionary character and opposition to the masses, whether it be the institutions of the military or the security services. The true reason for this temporary influence is the betrayal of the liberal opposition, as represented by the National Salvation Front, of the goals of the Egyptian revolution and the blood of the martyrs, in order to shorten their path to power. The true reason is the absence of a united revolutionary political alternative capable of exposing the Front and winning the masses to a concrete revolutionary program; a project that can surpass both the liberal and Islamist elite and proceed forward to deepen the Egyptian revolution, sweeping away all of the institutions of the old regime, including the military and security institutions, which are the heart of the counterrevolution. The masses have not revolted anew out of a desire for military rule or love for the feloul liberal alternative to the Muslim Brotherhood. They have revolted anew because Morsi and the Brotherhood betrayed the revolution. The Brotherhood did not implement even one of the demands of the revolution for social justice, freedom, human dignity or retribution for the martyrs of the revolution, whether they fell at the hands of Mubarak and al-Adly, or the Supreme Council of the Armed Forces (SCAF), or the Brotherhood and the Interior Ministry during the period of Brotherhood rule. In fact, Brotherhood rule deepened the same policies pursued by the Mubarak regime--of impoverishment and corruption, and the desperate defense of big business in the service of American and Zionist interests. Rather than purging the state apparatus of corruption and of those who smeared their hands with the blood of the martyrs, whether in the Interior Ministry or the military apparatus or secret police, the Brotherhood held to its bargains with them, hoping for the participation in the state administration alongside the feloul and Mubarak's men. Thus, Brotherhood rule became merely an extension on all levels of the Mubarak regime against which the Egyptian people had revolted. THIS IS the essence of the new revolutionary explosion which began on historic June 30. The Brotherhood did not understand this essence, so their popularity evaporated within months. And this is what the leaders of the military do not understand--nor their civilian cover represented by the liberals and feloul of the National Salvation Front. For they are not being forced at gunpoint to pursue the same policies pursued by Morsi, the military council and Mubarak before them--the same neoliberal economic policies, the same strategic alliances with the oppressive monarchies of the Persian Gulf, the same humiliating dependency on American and Zionist colonialism. The governments and media outlets of the American and European bourgeoisie are trying to describe what has happened in Egypt as if it were only a military coup against a democratically elected president, or a coup against the "legitimacy" of formal democracy. But what has happened in reality far surpasses formal democracy, with its ballot boxes. It is legitimacy via the democracy of the popular revolution--direct democracy creating revolutionary legitimacy. It opens the horizons to new forms of popular power, which dwarf the temporary democracy of the ballot box that results in nothing but sustaining bourgeois rule with its different wings. The temporary democracy of the ballot box ensures only the continuance of power of the capitalist state apparatus. It ensures the delusions of the people who believe they rule because they choose once every few years who among the bourgeois elite will rule and exploit them--without, of course, getting near to the state apparatus or the sheltered capitalist corporations through the manipulation of the ballot box. What has happened in Egypt is the height of democracy, a revolution of millions of people to directly topple a ruler. As for the military displacement of Morsi, this was nothing but a foregone conclusion once the military institution saw that the masses had already settled the issue in the streets and squares of Egypt. El-Sisi did on July 3, 2013, what Tantawi did before him on February 11, 2011; he acquiesced to the will of the rebelling populace, not out of any patriotism or revolutionary fervor, but out of fear of the revolution. For if El-Sisi had not intervened to dislodge Morsi, the revolution would not have stopped with the overthrow of Morsi and the Brotherhood, but was--and still remains--competent to transform into a complete social revolution which would oust the entire capitalist state, including the leaders of the military establishment. The military establishment is hostile to the Egyptian revolution. It got rid of Mubarak to save itself from the crossfire of the revolution. The military is now getting rid of the Brotherhood and Morsi, its erstwhile allies, in fear of the time when the earthquake of the revolution will reach it. Just as broad sections of the populace were affected by the illusion of army neutrality and its stand with the revolution at the beginning of SCAF rule, they are affected today by the lying propaganda about the heroism and revolutionary allegiance of El-Sisi and his generals. But just as the masses quickly left behind that propaganda in the days of Tantawi through experience and struggle, they will pass anew through the illusion that "the army and the people are one hand" in the weeks and months to come. 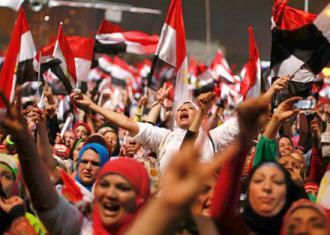 THE EGYPTIAN masses have managed to overthrow two presidents in 30 months. This mighty power is not reflected only in millions-strong protests, but also in the subsequent waves of labor strikes and popular demonstrations. For political confidence will transform into confidence in the social and economic struggle, and vice versa. After the first revolutionary wave, the army had wagered on the organizational and populist capabilities of the Brotherhood to assimilate and abort the revolution. But this gamble failed on June 30. Now, the army is gambling on the liberal opposition for the same goal. But the vast field between the expectations of the revolutionary masses and what the liberal forces are offering them in terms of economic and social policies amid a deep economic crisis will quickly lead to the exposure of these forces, and behind them, the true rulers of Egypt, the military and security institutions. One of the hazards that we will face in the coming weeks and months is that the wave of repression directed at the Muslim Brotherhood and the Islamist movement will be used as propaganda by the liberals and for security purposes by the army and the police to strike at the labor movement and popular demonstrations, on the pretext of maintaining stability during "this critical period." Restoring the security apparatus to confidence in facing the Islamists will be translated without doubt into waves of repression against strikes and sit-ins under thick cover by the bourgeois media. Because of this, we must be consistent in opposing all forms of abuse and repression to which the Islamists will be exposed in the form of arrests and closures of satellite channels and newspapers, for what happens today to the Islamists will happen tomorrow to the workers and the leftists. The dilemma of the Egyptian revolution today is the political weakness of revolutionary forces espousing the demand of continuing the revolution, with the social demands at its heart. For these forces, the ballot box will not suffice, and they will not accept the continuance of capitalist policies of impoverishment. They will not abandon the demand for retribution for the blood of the revolutionary martyrs. They will continue to insist upon the overthrow of Mubarak's state, including its security, military and judiciary institutions. These institutions still control the country and still protect the interests of the big businessmen and Mubarak's feloul. They remain a great swamp of corruption, plunder and despotism. It is incumbent upon the revolutionary forces today to unite their ranks and put themselves forward as a convincing revolutionary alternative for the masses--an alternative to the liberal forces who are ascendant today on the shoulders of the military, and to the forces of political Islam which have dominated over broad swaths of the population for decades. We must create a platform to unite the economic and social struggle among the ranks of the workers and the poor, to unite all of the oppressed sections of society. For it is these people who have an interest in continuing the revolution, an interest in toppling the heart of the regime and not just its representatives, whether that be Mubarak or Morsi in the past, or perhaps ElBaradei in the near future. So we begin from this moment preparations for the third Egyptian revolution inevitably to come, to be ready to lead this revolution to final victory. For the masses have proven anew that their revolutionary energy is endless, that their revolution is truly a permanent revolution. Let us rise to the task of this historical responsibility, and let us work together for the success of the revolution.